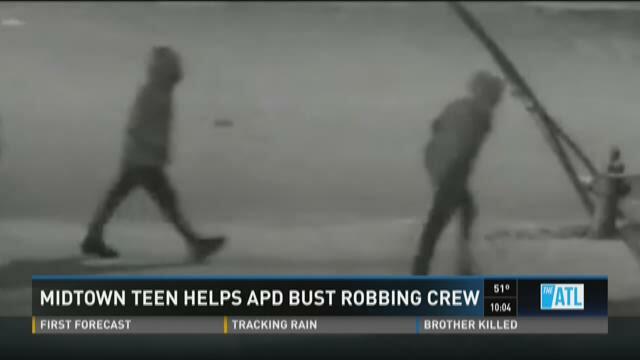 ATLANTA -- A Midtown teen is being hailed as a hero for helping police bust a violent robbing crew. Atlanta police say the five suspects had been preying on local residents for days. The car they used to stalk their victims was stolen, and they had two loaded weapons in their possession. "They're bad guys,” said one of the officers on APD’s special tactical unit. “They're violent bad guys." In fact, police say they pistol-whipped the victims in one incident on 8th Street. The next day, the same crew robbed another person before they were finally caught. "We immediately called for back-up,” said one of the officers who boxed them in. “We had the cavalry come; we were able to box them in. In their attempt to flee they hit one of our vehicles. We were able to extract them from the vehicle." But none of that would have happened had it not been for the teenaged girl who chased down one of the thieves --barefoot, no less-- just minutes before. "The kid reaches through the window and grabs the phone without batting an eye,” said the girl’s father, Ron Fisher. “She jumps out of the van throws off her shoes and chases him down." Fisher said he is not surprised by her courage. The robbery happened in the Greenwood Avenue section of Midtown near Vedado Park. “The getaway vehicle was parked at that fence,” Fisher said, pointing. “And the fence and the tree is where he jumped over the fence and hid. (That’s) where she cornered him." But that's also when the suspect pulled a gun. The teen backed off and called 911 with a description of the gunman and the stolen car. Minutes later, that's when police grabbed the five suspects. Their identities are being withheld as police see whether they are also responsible for a recent rash of crimes in the area. “It was a gutsy move, just not one we'd ever want her to do again,” Fisher said. “We would not encourage anyone else to do it as well. We just very pleased and happy that it ended the way it did."